Two-fers. Colorado’s PS Audio have a terrific knack for combining two products in a single box. 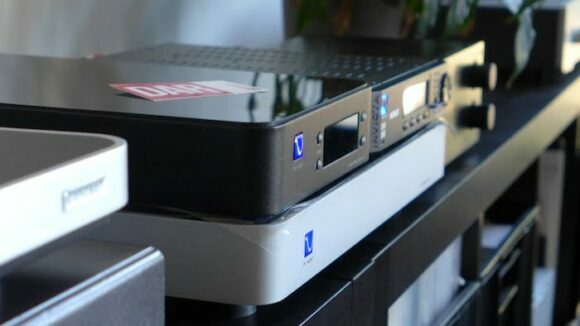 Their Powerbase joins isolation platform and power conditioner whilst the PS Audio NuWave Phono Converter (US$1895) piles an analogue-to-digital converter (ADC) on top of a phono stage. I own both but it’s the latter enjoying pixels here. In Part 1 of this review I demonstrated how the NPC can be deployed with a digital pre-amplifier. Here, in Part 2, the notion of vinyl’s digital conversion and playback is extrapolated. A Clearaudio Concept turntable sat at the front of the vinyl playback chain. The Concept ‘table comes pre-installed with a (very good) Concept MM cart. This combination sounded cooler, more-stand-off-ish than the outgoing re-plinthed Lenco. I’d say the Concept really benefits from a cart with a little more pep. After a couple of weeks listening, a MK1 Zu DL-103r supplanted the stock Concept cart. The Zu surrendered a little structural bone in favour of more meat and connective tissue. 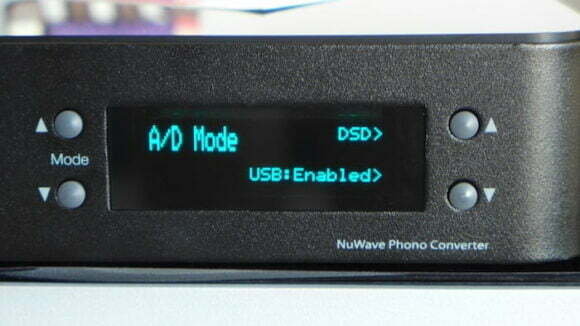 Phono pre-amplification was provided by PS Audio’s NuWave Phono Converter (NPC). So far, so standard. 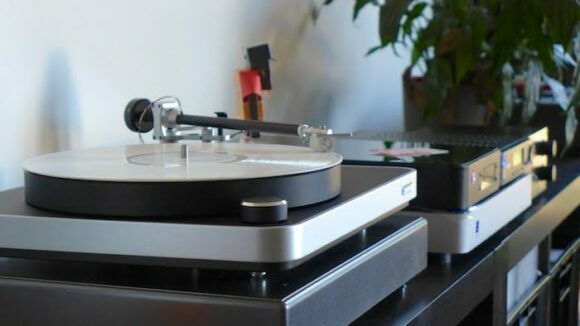 However, this being Digital Audio Review, there’s a wrinkle: pivotal to both vinyl and digital rigs sat a DAC: Resonessence Labs’ rather splendid INVICTA Mirus. The PS Audio NPC has traditional analogue outputs but a switchable option within the front-panel menu enables the NPC’s internal ADC. That same analogue signal then gets digitised on-the-fly to PCM or DSD. The resulting digital stream can then be sent over USB to your computer for permanent storage and/or output over S/PDIF via the NPC’s coaxial socket, to which I had lassoed the Resonessence Labs DAC. S/PDIF’s bandwidth limitations meant only single-rate DSD travelled along the Zu Audio Mission digital interconnection. The Mirus is a D/A converter of sufficient calibre that a 24/96 PCM stream had already shown itself (in Part 1) to be utterly indistinguishable from the analogue output of the NPC itself. This wasn’t the case with the NAD D 3020; its digital inputs are easily bested by a healthier analogue feed. Tea-time. Turntable purists should probably stop reading right here. This past month I’ve been listening to records via DSD. Why? Because I can. 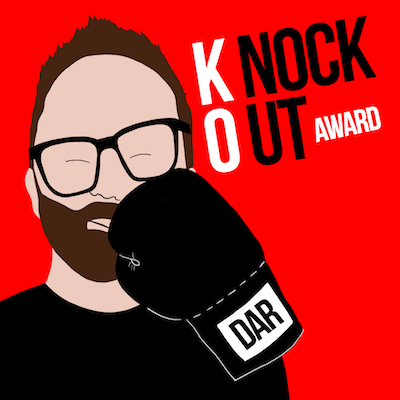 I listened exclusively to single-rate DSD and then, later, to 24bit/96kHz PCM encodes. The audible differences between PCM and DSD here were significant. 24bit/96kHz PCM is louder than DSD – some downward volume adjustment was required. Volumes matched by ear, PCM was still notably livelier and punchier than the DSD encode/decode. PCM’s zippier handling of transient attack contrasted DSD as more languid. DSD ups that ‘sense of ease’ (so often attributed to vinyl playback itself). DSD was better suited to softening the buzz-saw guitar stabs of Les Savy Fav’s Root For Ruin where leading edges could often itch-teeth. Ditto Dinosaur Jr’s Farm. However, something like Tricky’s Maxinquaye benefitted from the kick-in-pants brought by clicking over to 24/96 PCM. 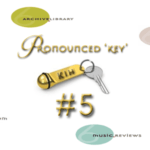 Flavour-flav. It’s probably no coincidence that PS Audio’s head guy Paul McGowan fingers 24bit/96kHz PCM as his preferred encode option on the NPC. He calls it out as such in the user manual. But I reckon having both digital audio formats to hand brings the end user flavour choices. That can only be a good thing. Do you fancy banana smoothie (DSD) or raspberry ripple (PCM)? Be careful though: whilst this might provide clues as to how PCM stacks up against DSD in general terms, it’s far from conclusive. A sample of one is insufficient, only telling us how each are implemented in this particular phono stage and DAC combination. I try to resist enthusing in such blatant terms but PS Audio’s NPC is one heck of product. It returns turntablism possibilities to direct digital amplifiers like those from Wadia, NAD and NuForce. A pair of analogue inputs on the rear (untested here) mean you can digitise ANYTHING. Hook the NPC up to a computer with Alpinesoft’s VinylStudio installed and you can commit those ‘rips’ to a hard drive. (That’s where I’m headed with this box – eventually). Until then, know that I think the PS Audio NuWave Phono Converter is one possible realisation of a definitive digital/analogue crossover product. From a professional point of view, the NPC’s capabilities as digital transport means I can continue to spin records whilst reviewing DACs. As such, I can’t think of any product that impressed me as much in all of 2013. Review unit = purchased! I understand that PCM & DSD sound different but which is more like the analogue output? thanks! @rexp The PCM – no question. A great Part 2 – now I’m really dying for Part 3 and how easy it is to get DSD128 rips and more importantly, how they sound on playback. Since the PCM rip sounds identical to the direct analogue out why do we need DSD? PCM recordings done right is clearly the way to go. Out of interest John how to 16/44 rips fare compared to the direct analogue out? Cheers, this is very interesting! PCM is as good as direct analogue ONLY IF you have a DAC of sufficient calibre. Lesser decoders will get found out and you’re better off using the analogue output of the NPC. The 16/44 take on things is a smidgen short of the analogue output but that might be down to the associated filtering as much as it is lower sample rate. Needs and wants are different. I might not want DSD but it’s of a certain flavour that I’m confident others will enjoy. One last question John, how does a 24/96 download/CD of the same album compare to the digitized vinyl? Not got that far yet – sorry. 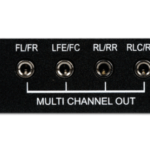 Perhaps I missed it in your review but how about the quality of the NPC phono stage? If one was purchasing it primarily to serve as a phono stage, is it as good as phono stages in the $1,895 price range? I would use it to rip vinyl as a bonus feature. I’ve deliberately skirted any conclusive comments on its prowess as a dedicated phono stage as I don’t have any similarly priced data points. I *do* know that its substantially better than the outgoing iFi iPhono, itself a little budget marvel.